Okay, Crystal, this post is for you! I took pictures of Zoë while she was eating because that was the only way I could get her to stop craning her head around so she could bat at the camera. We seriously go back and forth about what colour this girl's hair is everyday. Sometimes it looks light and other times it looks dark. She's still super bald on top—so perfectly bald, right up to about the middle of her head. And then her hair is so sparse that it looks lighter than it actually is (at least, that's what I keep telling myself because I'm on Team Brown (though we'll love her with whatever colour of hair she develops)). It's thickest in the back, around her neck, though it's still really thin. It's too dark to be truly blonde (but I also never thought Benjamin would end up blonde until I cut his hair the first time so perhaps I'm not the best judge). It looks light brown to me, especially when there's enough of it to "gather." I think I'll classify her as a "light ash brown" or some other "light brown showing small signs of blondism." It's not blonde, not necessarily. It's just not there! Rachel is in the top left and she definitely has dark hair. Miriam, who has officially lost the title of My Baldest Baby, is in the top right. She was quite blonde as a toddler and is more of a dirty blonde now. Benjamin had darker hair as a new baby and I was convinced it was brown until I cut it and then I was like, "Whoa! He's got blonde hair!" So, maybe Zoë really does have blonde hair. But maybe it's brown. Mostly it's just...not there. And cool it with the teething, already, Zoë! At seven months Rachel had her two bottom teeth already, but her top teeth were still tucked well away. Miriam was just starting to get her two bottom teeth but they hadn't broken her gums yet. Benjamin was showing no signs of teething. Zoë has three teeth with three more working their way through. At least I know she can grow something if she's not going to grow any hair! 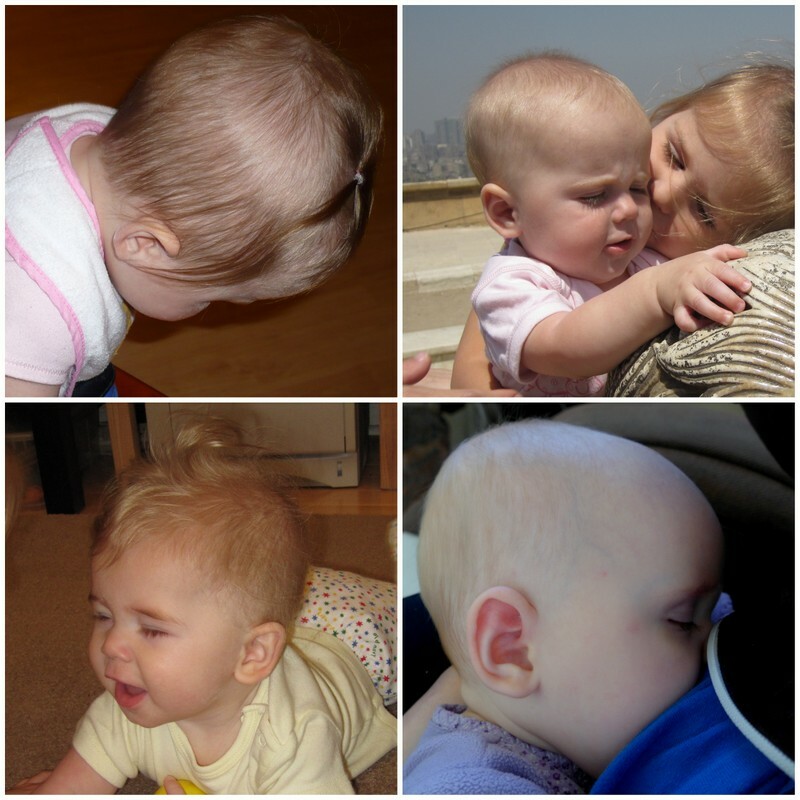 How fun to compare the children's heads/hair at 7 months! Well in our house she would definitely be a blonde but I do see that hint of brown :). Look how bald Miriam was and now she has a ton of hair multiple times over. It will come! I think even Nancy was a blonde in Egypt! It's all relative, right?! Look at your baby book--I think Zoe is taking after you in the teeth department. You and David both had teeth early. But I think I wrote it down for you--can't say the same thing for Josie! So look, and tell me what it says.